A chicken stock based soup, made with a homemade cream sauce, sauteed vegetables and fresh mushrooms. Did you know that if you transfer mushrooms from the plastic wrapped, Styrofoam container they come in from the grocery market, to a plain brown paper bag, they will last longer? It's true, try it. Unfortunately, they still won't last forever, and if you're like me, sometimes we buy them with the intention of making something in particular and then forget about them and end up with some mushrooms that need to be used up quick like! Now first, let me be clear. I have nothing against canned, condensed cream soups, and, in fact, although I use them primarily for cooking, I've also made soup straight from the can. Cream soups are definitely handy, especially for making what I call southern béchamel, a quick sauce. There are also many, many recipes that actually call for them, and frankly aren't quite the same without them. Sometimes they add a certain familiar flavor that's missing with a homemade sauce, and while I do love a good homemade white sauce, I still use my cream soups. I usually keep a variety of them on hand in the pantry for that very reason, but there have been times, such as back in 2010, when I went to make a casserole and found myself without a single can of cream of mushroom soup in the pantry, and no time to run to the store. Since I usually keep some canned mushrooms in the pantry, it was easy to make a copycat replacement and I have used that many time, as many of you have told me you also have! 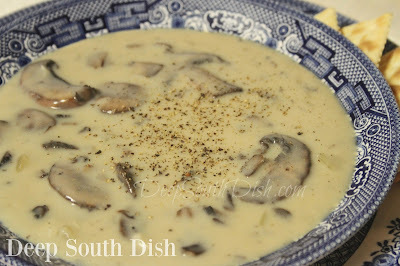 Today we're making a cream of mushroom soup with a homemade cream sauce and fresh mushrooms. Here's how to make it. Sprinkle some cayenne,Cajun seasoning and/or freshly cracked black pepper on top and dig in! For more of my favorite soup and stew recipes, click over to my collection on Pinterest! Set aside half of the sliced mushrooms and coarsely chop the remaining mushrooms. Melt the butter in a medium saucepan and saute the onion, celery and garlic over medium heat until tender, but not browned, about 3 minutes. Stir in the chopped mushrooms and salt; cook and stir about 2-3 minutes. Stir in the flour a little at a time, until blended, cooking for 3 minutes, stirring constantly. Increase heat to medium high and slowly stir in the broth a little at a time, until fully incorporated. Add sliced mushroom, reduce heat to medium low, cover and simmer for 15 minutes. Stir in milk or half and half and heat through, adding additional milk if needed for desired consistency. Add pepper, taste and adjust seasonings. Garnish individual bowls with a pinch of cayenne, Cajun seasoning, or freshly cracked black pepper. 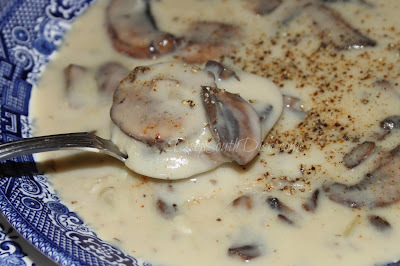 Cook's Notes: I've used Baby Bella mushrooms (Crimini) in the soup pictured, but use regular Portabellas, White Button, Shiitake, or your own personal favorite. Cream of Vegetable: Prepare as above, except omit mushrooms and substitute 2 cups cooked vegetables (leftover or frozen, thawed). Puree half and add to soup, add remaining half to soup and heat through. This soup is DELICIOUS! Thank you for sharing. I so glad you enjoyed it and thank you so much for taking the time to stop by and let me know! Hi Mary! Your recipes are a God send and have helped resurrect a few tastes my grandmother didn't write down, God rest her soul. Have you ever tried canning this? We've been trying to reduce our use of store bought since making at home is always cheaper and usually better. Just curious if you thought it would can well. Since my canning experience is very limited, and only to water bath anyway, I'm really not sure but I would guess you could can both the condensed concentrate as well as the soup itself. I suspect that would require a pressure canner though and I've not ventured into that gadget! I would suggest searching for a recipe that was specifically written for that though as I don't know that my ratios would be correct anyway. Sorry I couldn't help more! I can answer the canning question, Mary, to the best of my knowledge. This recipe has low acid vegetables and meat broth. It would have to be pressure canned, by the time, temp and pressure setting of either the meat stock/broth or the veggies, whichever is higher. HOWEVER: The National Center for Home Food Preservation does not recommend canning at home recipes containing dairy or flour. Although you might can find recipes on the web using them, this verboten is pretty much universally followed. To safely can your recipe, both milk and flour must be left out. But the taste, flavor of Fresh Mushrooms is delicate. The high temperatures and pressure of canning would destroy it, don't ya think?